This type of UV hybrid UV flatbed printer adopts 4 Konica Minolta print heads and features fast printing speed. It is suitable for corrugated paper, foam core, PVC, ceramic tile, synthetic glass, wood, metal sheet, paper, advertising banner, mesh fabrics, adhesive vinyl, etc. The images printed by this UV hybrid UV flatbed printer are waterproof, anti-ultraviolet, scratch-resistant, and of high definition and bright color. 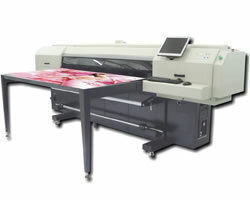 For producing standard quality images, the printing speed of this flatbed printer is 16.5 sqm/hr. For high quality images, the maximum speed is 11.5sqm/hr. When this flatbed printing machine is used to produce ultra-quality images, the printing speed is 8.5sqm/hr. 4. This flatbed printer has a maxium printing width of 183cm, so the maximum media width can be 185cm, and the maximum media thickness is 4.80 cm. As an experienced UV hybrid UV flatbed printer manufacturer in China, we also provide a great variety of eco solvent printer and color inkjet printer to satisfy your different applications. These printers are reliable in quality and are widely used as acrylic printer, leather printer, ceramic printer, UV adhesive vinyl printer, etc. If you are in need of UV hybrid UV flatbed printer or other products, we welcome you to contact us at any time! At Runtianzhi, we will do our best to serve you.